Lobo with his mount – the all-new Ranger 6x6 EFI – outside Wayne Leonard Motorcycles. 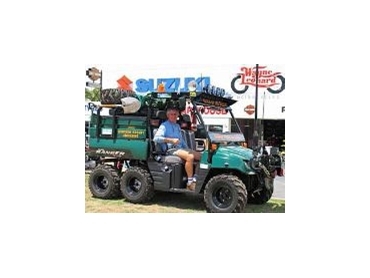 ATV Adventurer and Tablelands developer Lobo Lancaster is well on his way to traversing all of Australia’s deserts. His latest voyage is an epic crossing of the Simpson Desert in the all-new Polaris Ranger 6x6 EFI, which was purchased from Wayne Leonard Motorcycles in Cairns. Lobo Lancaster is a man who not only loves the desert, but who loves to cross deserts in – as he puts it – “unusual vehicles” - ATVs. It seems the freedom of being able to tackle just about any terrain, just for the hell of it, is a mighty thrill. Lobo points out that while off-road utilities like the Ranger 6x6 may not cruise at highway speeds as conventional 4WD’s will, their extreme tractive ability opens up a feast of off-the-track adventuring possibilities. Lobo is definitely one bloke who has a lot of time for the desert. Having crisscrossed deserts from the Sahara to the Tanami, he’s become a confirmed desert specialist and just as one ought to prepare rigorously for a sea voyage, so Lobo is ultra-fastidious about preparing his vehicles for the sandy seas ahead. His special brand of over-preparation extends to carrying up to 300 litres of fuel and at least 100 litres of water in his ATVs– a hefty stash indeed for any ATV. Yet this amounts to not quite half the Ranger 6x6’s 800kg payload capacity. Lobo has kitted his Ranger out to be a veritable oasis of self-reliance, equipped as it is with a massive 2722kg winch, a vast chiller capacity and, of course, a very solid-looking Bundy-branded drinks holder. Lobo expects to embark on his 2006 Simpson Desert crossing around April this year, and by all accounts it ought to be his plushest expedition yet. His new 700cc 6x6 Ranger – the first of this new model sold in Australia – comes complete with a roll-cage, roof and comfortable car-like seats, rather than the seat-straddling position Lobo endured on his old Sportsman 6x6. The new Ranger features maintenance-friendly shaft drive, rather than the sand-sensitive chain drive of its forebears. All up, the new Ranger is a more capable and kindly beast, which of course should see Lobo make more use of the aforementioned cup holder. You can find information about the complete line of Polaris products from authorised Polaris dealers on freecall 1300 654 142 or at www.polarisindustries.com.